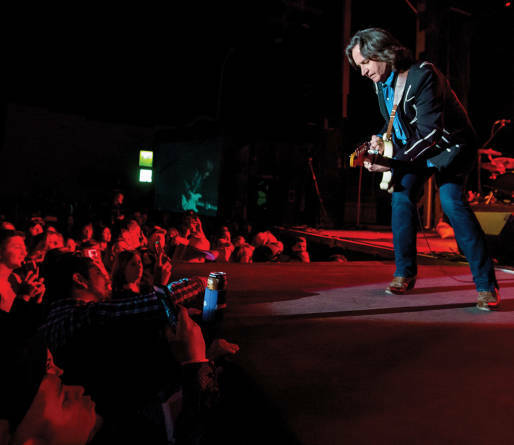 Above: The Nitty Gritty Dirt Band, with Jeff Hanna on guitar, performed at last year&apos;s Las Cruces Country Music Festival. Las Cruces is the heart of the Mesilla Valley, an agricultural region rich in pecans, cotton, cattle, and chiles. The city itself is home to the New Mexico State Aggies and the state’s Farm and Ranch Heritage Museum. So when the Convention and Visitors Bureau was looking to attract people to southern New Mexico in the springtime, the idea of a country music festival was, as the cowboys say, sure as a gun. The Las Cruces Country Music Festival returns for its fifth year April 28–30. The celebration of America’s fastest-growing musical genre draws big names like this year’s Tanya Tucker, Travis Tritt, and the Marshall Tucker Band, along with rising stars Kacey Musgraves, the Eli Young Band, and Las Cruces native Bri Bagwell. Attracting a capacity crowd of 5,000 each night, the event coincides with NMSU’s season-ending rodeo. “We didn’t want it to be a typical festival,” says Philip San Filippo, the bureau’s executive director. “We wanted it to be a family event.” True to the notion, kids under 12 get in free. The response to the event has been impressive—online ticket sales jumped by a factor of six this year. Credit that growth to festival organizers pulling in trip-worthy musicians and showcasing them not only on big stages but at intimate events, like the traditional Sunday-morning Country Brunch, featuring unplugged, up-close sets by festival performers. With the help of a Nashville promoter, the festival has consistently wrangled some of the best up-and-coming artists from Music Row. In previous years, they’ve roped in new names like Aaron Watson and Dustin Lynch, as well as legends Lee Ann Womack, Rick Trevino, and the Nitty Gritty Dirt Band. Visitors come from 26 states, providing a boost to local businesses and a kickoff to the country music festival circuit that runs through the summer, putting the City of the Crosses in the national spotlight among the Stetson set. “To watch this festival grow from nothing to where it is today is amazing,” San Filippo says.